This is a bittersweet post. Yesterday, Terri's mom Bernice Schaefer completed service to her Lord. She was called home to spend eternity with Him at about 11:30 yesterday morning. Please keep all the family in prayer as arrangements are made and some begin to travel. Terri is scheduled to go home today! HUGE answer to prayer! She will still be receiving chemo, but she'll be home! She's worked very hard to get to this point! Hurray! She Walked.... We shout HIS praises !! After over six long weeks of being "basically bedridden", Terri ( With the strength of our Lord and the help of her Physical Therapist and a walker ) got up out of her bed and walked about 20 steps yesterday!! Then today... She again stood and this time she walked out of her room and down the hall = 50 feet!!!! Through tears of joy and gratitude we thank HIM and all the dear saints who continue to hold Terri up before the throne of grace. Her Oncologist remained true to his word and began setting the wheels in motion for her release which could be as soon as Monday. IV medications were discontinued this morning and we pray the nephroscopy bag will be removed tomorrow. Terri will need to continue to work hard thru all the pain and nausea even after we get her home but we rest in the knowledge that our dear Savior has taken our stripes and she will be fully healed. Please pray for His hand of mercy and strength as Terri works thru this weekend and beyond... We look forward to her "Independence" on Monday !!!! raised" with regards to giving medical information to Terri's Sister, Ann. Terri holds power of attorney and can't manage things in her present condition... I personally am seeking God's direction with regards to a new emploment opportunity ... So yes, the winds rush in; but HE is there !! HE will calm the storm, HE will carry us over these mountains and thru the valleys to greener pastures... With continued humble thanks to HIM first and to all the saints. This is a report from Lanny Evans, an Elder at our chapel. He and a friend went to see Terri this morning and this is what they saw! This morning Terri was bright...if even feisty. She looked good and was very talkative, expressing her gratefulness for all the things being done for her family, giving specific acknowledgement to several ladies who have so greatly extended their love to the family in such practical and meaningful ways. She is anxious to get her cell phone recharged so that she can catch-up on e-mails and is anxious to get back on her blog once her sight improves. The pulmonary issue that took her to the ICU yesterday seems to have stabilized and she was scheduled to resume her 6th(?) of 10 radiation treatments to the area of her brain behind her left eye late morning. It is likely that she will be taken back to a regular room later today. Rick, too, is encouraged with the morning report, though perhaps not quite as alert and feisty as Terri because of a lack of sleep (or coffee). Both Terri and Rick want everyone to know of their great appreciation for the many meals provided and other kindnesses of their fellow believers but mainly they are grateful and continue to requests everyone's prayers for Terri and the family. Rick text me this morning that Terri had fell into respiratory distress. They have stabilized her and are moving her to the ICU. It's been a rough weekend for Terri and family. She has been suffering quite a bit of confusion and nausea, to name only a few things. A series of test's revealed that her kidneys are basically shutting down. Sunday they performed surgery to place stint's in both kidneys. They were only able to reach the right kidney and did successfully get the stint in it. She will be undergoing another surgery in the next few days to place an internal port to help with the drainage. They also took a look at her bladder while they were in there and had some concern so they took some biopsies. Those results should be ready in a few days. "So far, Terri seems to be more "with it". The physical therapist just left. They worked with leg exercises and got her in a chair to be upright for a bit. She is fighting hard!" For some, it may seem that all hope is lost and healing is not even a possibily with all that is going on. But in actuality, we have a God that loves to do things in GRAND ways. I'll bet that on day 39 of being on that ark, Noah and his family probably thought that nothing worse could possibly happen. Their world was gone. They were stuck in a stinky boat floating on tons of water with no dry land in sight. But God had a bigger plan and chose Noah and his family because He knew they would be faithful in all things. And I'm willing to bet the Noah's were on their knee's so often during their stay in the ark, that they had to rotate spots in the ark so as not to rub a whole in the bottom of it. Please take a moment, get rid of distractions, get on your knee's and ask the Lord to heal Terri. God said it, I believe it. I've had this song on my heart lately and thought it was appropriate for this post. Have you ever taken the time to get down on your knee's and PRAY? It's powerful stuff. Follow by Email and get updates sent to you! 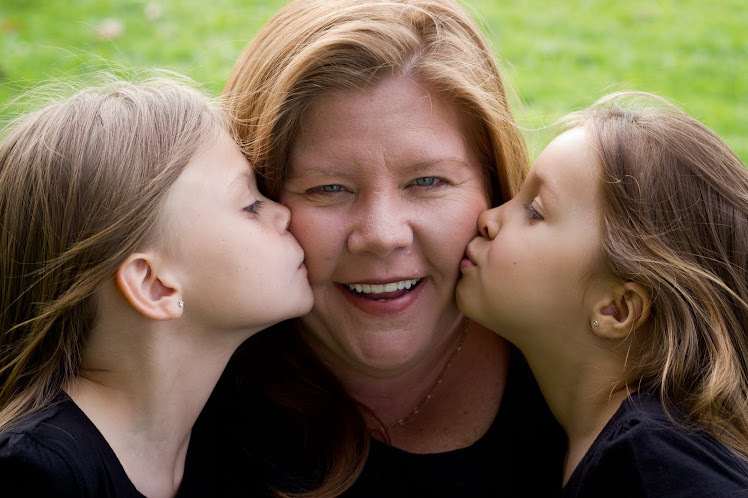 Terri has been diagnosed with breast cancer that has spread to her liver and spine. Terri is the mother of 5 grown children, and 5 young adopted children still at home. We rest in the healing arms of our Great Physician. We kneel humbly in fervent prayer as we know that this is all apart of HIS plan, to HIM alone be all the honor and glory. Many of you have asked how you can help Terri Blount. Prayer is number 1 right now, but there are a few practical ways as well. All meal planning and shopping is now Rick's responsibility (along with a million other things!) so one big way is to help provide meals.They still have 5 hungry little mouths to feed at home so I can imagine that can be overwhelming. A meal schedule has been created using TakeThemAMeal.com. If you would like to sign up, you can access the meal schedule by clicking here, or by visiting TakeThemAMeal.com and locating the schedule by recipient last name (Blount) and password (blessed). Many of you are sending your prayers from miles away and are unable to bring meals. You can still help! Rick has been driving back and forth from home to hospital to daycare to work, ect, so he is using up lots of extra gas. GAS GIFT CARDS would be a great idea for them. Also, PUBLIX and WALMART gift cards would help tremendously. If you are intrested in helping them out in one of these practical ways, please contact Sophia Avila (Sophialavila@gmail.com) and she will give you their address.